I wrote and led this ritual on February 15th, 2003 -- the day after Valentine's Day. The focus of this ritual is love, but not just in the cheesy Valentine's Day sense. It's about love of the self, love of the group, and love of each member of the group, whatever form that love takes. It was written with my 9-person circle in mind (one couldn't make it, which is why I'm octally focused), so I encourage you to modify it to fit your own group. Our circle has practiced together for about two-and-a-half years, so we know each other very well, and so the were able to give deep praise in the "wheel of love" exercise. 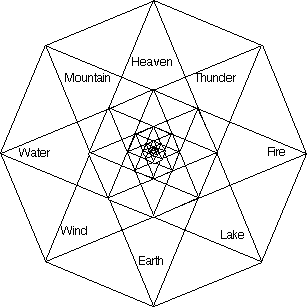 Everyone selected a direction/element combination, but part of the idea of this ritual is to find how every element is found in every direction, and every direction is reflected in all others (for if you walk far enough west, west becomes east). The eight elements I use are taken from the I Ching. The element/direction associations I decided as I was writing, based on my location (Boulder, CO). Everyone stayed "in character" as their element in the other-love exercise, and the items in parenthesis are the I Ching passages for which the two elements are constituent parts. (The first concept is the first element on bottom.) The holy moment can take these concepts into acount as catalysts or they can be ignored. They're included largely for reference. I had planned to invoke goddesses of friendship, but found very few such deities, but a wealth of love goddesses. (Oshun is goddess of love, pleasure, beauty, and diplomacy, which is as close as I got.) If you know of a god or goddess of friendship, please let me know. Thanks to Liane who emailed me after discovering that "Eyasha is the Santharian goddess of friendship." The first stanza of the eighth calls is from The Enlightened Mind: An Anthology of Prose by Stephen Mitchell. If you have comments or questions about this ritual, please let me know. Thunder: The way two mirrors placed opposite each other will reflect an image ad infinitum. Mountain: Or an individual consciousness, or a cell, or an atom. Wind: And a change in one jewel means a change, however slight, in every other jewel. Lake: Join us this night. Mountain: Of our fellow beings. Fire: And love for each jewel. Water: Whose homes are in each direction. Wind: But we find you everywhere. Lake: big skies of Heaven. Thunder: as the Creative makes colors dance. Earth: We call upon you. Heaven: Heaven, North: you are welcome. Water: small ponds and wide gulfs of Lake. Earth: as the Joyous guides a boat. Mountain: We call upon you. Lake: Lake, SouthEast: you are welcome. Thunder: springs, rivulets, and the refreshment of Water. Mountain: as the Abysmal flows through the land's veins. Fire: We call upon you. Water: Lake, SouthEast: you are welcome. Earth: across the plains the rumble of Thunder. Fire: as the Arousing shakes the foundations. Wind: We call upon you. Thunder: Thunder, NorthEast: you are welcome. Mountain: deserts and rainforests of Earth. Wind: as the Receptive sustains and brings forth beautiful life. Heaven: We call upon you. Earth: Earth, South: you are welcome. Fire: towering majesty of Mountain. Heaven: as Keeping Still causes change with quietude. Lake: We call upon you. Mountain: Mountain, NorthWest: you are welcome. Wind: the sun rises, spreading the gift of Fire. Lake: as the Clinging energizes and vitalizes life. Water: We call upon you. Fire: Fire, East: you are welcome. Heaven: whispers of an ancient people are still heard on the Wind. Water: as the Gentile makes great things happen with small vibrations. Thunder: We call upon you. Wind: Wind, SouthWest: you are welcome. And those without stay without. Each person will take a turn as the "hub" in a "wheel of love." The hub stands in the center and faces each person in the circle in turn. The person in the circle tells the hub what they appreciate, love, or respect in him or her. Depending how well people know each other, this could be as deep or surface as desired -- "I love how you support me whenever I have a breakdown" is valid, as is "I like the way your eyes sparkle." The hub is not allowed to protest compliments. Place a mirror in the center of the circle, and have everyone look at themselves in it for a few minutes. (They can look longer, if they like.) Everyone will then write or draw several of their positive qualities. You may not feed yourself. Freeform blessing. We had Belgian beer and chocolate-covered cherries (which are easy to feed to other people). Freeform, string passing from the speaker to whomever they desire.